There’s no denying that times are hard. War, abuse, violence, starvation, poverty or widespread economic breakdowns are all too commonplace in the news, across the world, without exceptions. It’s In times like these that everyone should come together – the ones who can should give to the ones who don’t have. Giving is something we can all do, because money is not the only thing that people need. Schools, organisations, orphanages, and individuals are asking for food, clothes, old shoes, pencils and notebooks… even just someone to talk to. We are all capable of giving and making someone’s day a little bit better. Here, at Always Ladies, this Christmas we donated to ‘families in need in the Athens area, Greece, where hard-working men and women hit hardest by budget cuts were not even able to afford heating during the winter.’ Helping others does not apply only for the holidays, of course, so we are committed to keep doing the same throughout the year, with the help of all of you who are part of our community. Recently, we came across an amazing initiative in America. Despite the fact that most celebrities are routinely accused of callousness towards the less fortunate, that is not always true. 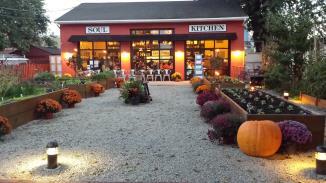 Jon Bon Jovi proves naysayers wrong by establishing the ‘Soul Kitchen’ community restaurant. In the ‘Soul Kitchen’ there are no menus, and no need for reservations. Customers can donate the minimum amount for their meal, or volunteer to help around the restaurant instead. When there is love, there is plenty. According to the restaurant’s official website: “Our vision here at Soul Kitchen is to serve healthy, delicious, and when possible, organic meals. At Soul Kitchen you will notice there are no prices on the menu and you might have been seated with someone you don’t know. Customers pay the minimum donation or volunteer in some way to earn a dining certificate for a meal. Jon Bon Jovi whose charitable foundation, in October 2009 had already built hundreds of homes in Philadelphia, is very passionate about this project. “One in six people in America are suffering at night and going to bed hungry, and one in five families live at or below the poverty line”, he says. “Twenty-four thousand dollars for a family of four? It’s just mind-blowing”. We are looking forward to the public showing their full support to this charitable and heart warming cause and we expect other celebrities to follow Mr Bon Jovi’s example. If you happen to be near the area of Red Bank, N.J, do visit the restaurant to make friends, smile, help, give, volunteer, cook and feel hopeful.